It’s funny about this book – see i don’t know why i thought that it was a novella at first – after i read Uglies, Pretties and Specials, I kind of felt like that was the end of the series since we had some sense of finality from Tally. Guess i was wrong, and i’m glad that i finally got around to reading extras. It’s great too that we actually got a different POV on things. So Extras takes us to Japan where we’re immersed in a ‘Reputation Society’ where your ‘face rank’ is what makes you important and gives you value. Basically this is such a socially tied society where the more you’re talked about, the higher your rank, and therefore the more you get. ‘merits’ ,property, invitations places etc. True to form, we meet our lead when she’s 15, basically the turning point in age across all these stories i think, and our lead is Aya – an ‘extra’ meaning basically no one that’s important and the younger sister of Hiro who is relatively famous. he’s a tech-head and has managed to break into the elite Top 1000 through his tech ability and being a ‘kicker’ which is someone that broadcasts stories or ‘kicks’ then via a live feed. All Aya wants in life is to get the recognition that her brother has – to be famous and have a better face rank so that she’s no longer an extra and unknown. So being a kicker herself, Aya has figured out that there’s one story that she could ‘kick’ that would raise her face rank and make her famous so that’s the path that this story takes us down. Aya tries to become something that she’s not by ‘truth-slanting’ so that she can get in with an elite crowd and from then on her life changes. Along the way, Aya manages to break through, and at the same time uncovers something that is life changing for everyone in the world and that’s really what gets her well known. As a result though, she’s managed to get the world into such a tizzy that Tally is forced to come ‘out of hiding’ and get involved herself. Honestly, it’s a nice tie in to the sign-off that she gave at the end of Specials and actually fits rather organically into this story. What i found to be really nice about this story is that we meet a whole cast of new folks while we’re reunited with some that we loved from books past. The Cutters are back to an extent and so is Andrew Simpson Smith. We have a great new group of Japanese friends and the story takes interesting twists with them all. It’s also pretty interesting to see how the social society really relates to our present day 2013 life where hubs like Klout determine who’s more keyed into their social networks etc. it makes you wonder if that’s where our society is going. anyway – check it out, it’s a nice continuation on the series and definitely a story that you shouldn’t miss. 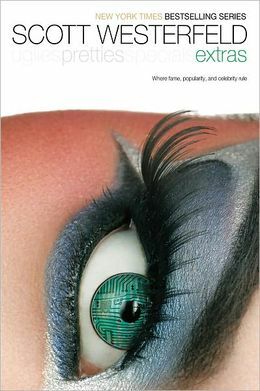 This entry was posted in Dystopian, fantasy, Reviews, Young Adult and tagged Dystopian, Extras, fantasy, Pretties, review, Scott Westerfeld, Specials, Uglies, YA lit by iscm13. Bookmark the permalink.